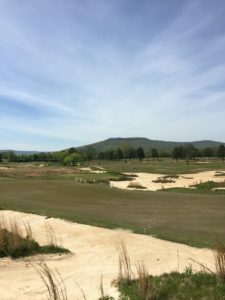 In his classic book To The Linksland Michael Bamberger wrote, in struggling to describe a golf course he was visiting for the first time, “How do you begin to explain the joys of Machrihanish?” I can relate to Mr. Bamberger’s challenge after my initial visit Sweetens Cove Golf Club in South Pittsburg, Tennessee. I avoid interstates religiously. People cannot drive, and they can’t drive at all on I-65 and its demonic North Alabama offspring, I-565. I have found that when traveling it is much more enjoyable to take the secondary roads and see some of the country. I’d rather take 30 minutes longer to get to my destination if it means I might see an old church or an abandoned golf course that I find interesting. All that said, we took the state highways from Hartselle to Huntsville, cut over the mountain on 4 Mile Post Road at Jones Farm, through Big Cove right past the Robert Trent Jones Trail courses at Hampton Cove and came out in Gurley, Alabama, where we headed northeast on Highway 72. 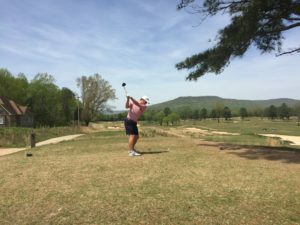 About 35 minutes past Scottsboro (home of the legendary Goose Pond Golf Course designed by George Cobb) you enter the state of Tennessee and shortly thereafter, South Pittsburg. The main claim to fame of this unassuming small Southern town has previously been that it is the home of the Lodge Cast Iron Factory, by no means an insignificant thing. 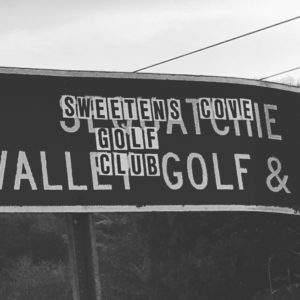 Look for the old Sequatchie Valley Golf Club sign and turn onto Sweetens Cove Road. 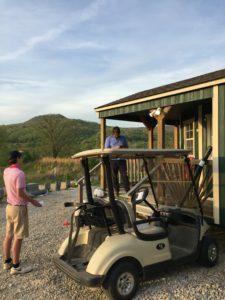 After a couple of pleasantly winding miles on a country road, with scenic Battle Creek always on your right, you will arrive at Sweetens Cove Golf Club. The anticipation of doing something is always at least half the enjoyment of it. Briefly, since this is my first post: I’ve played golf since I was 5 years old. I am an Architect, I’ve designed buildings all over Alabama. I also inherited a love of cooking from my late grandmother. I hope to touch on all these topics at some point in this blog, though it will lean most heavily on golf. 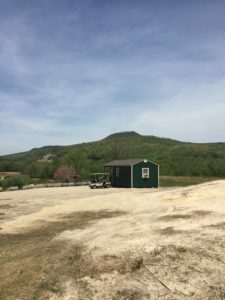 I learned about Sweetens Cove on podcasts from places like thefriedegg.com and nolayingup.com, as well as a wonderful article in the new golf literary magazine, The Golfers Journal. I won’t try to recount the interesting story of how the course came into being, as its already been told very well in these other venues. I also won’t try to get into technical details of the architecture, as those are also already covered expertly by others. 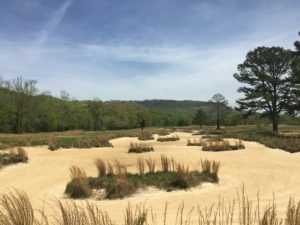 I will just say that as an Architect and designer myself, I am amazed at the level of creativity, and yet wonderful simplicity, the King Collins Golf Course Design firm achieved at Sweetens Cove. Upon arrival at the course, we pulled into the gravel parking lot and got our first view of the club house. We were immediately greeted on the “front porch” by the semi-legendary Patrick, the General Manager and leading prophet of Sweetens Cove. He welcomed us inside and began to apologize for closing the course the previous weekend due to torrential rains. He actually remembered that we had been well into our 2 hour drive the previous Saturday, when he had called to tell us the course was closed. This struck me as unusual right off the bat. I’ve played golf all over the US and I can count on one finger the time something like this has happened before. 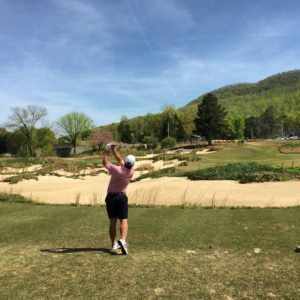 My son Jake had made the previous tee time and hadn’t even left his cell number, but Patrick had apparently written it down and had called us to apologize for closing the course that day, and now he remembered that and was apologizing to us again in person. He said he was only going to charge us the weekday rate, since we were cancelled the previous Saturday. Patrick knew it was our first visit so he gave us a quick primer on the course. A few things stand out. He told us the game can be, and is encouraged to be, played “along the ground” at Sweetens. There is no out of bounds. All the bunkers are waste areas. Finally, all lost balls in native areas, water hazards and “otherwise” are treated as lateral hazards. Think about these things. They are remarkable in their own right. We paid our fee for the day and headed out to the first tee. On the way to the tee, a gentleman who had just finished playing, stopped me and asked excitedly, “Is this your first time here?” When I replied that it was indeed, he basically whispered, “There is nowhere else like it. I come over twice a month from Atlanta and play all day. You will love it.” How many times have you had a conversation like that by the first tee at a golf course? Not many, I’d wager. It is not hyperbole to say that the Par 5 1st hole at Sweetens Cove wouldn’t be out of place in The Open Championship. It is that good. 2 of my boys were playing with me. 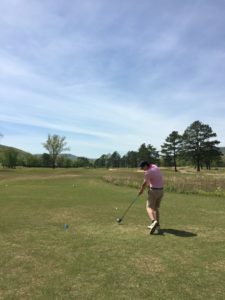 Jordan is a competitive college golfer and plays off a +1 handicap. He chose to play the black tees. Jake and me, higher handicap players, chose to play the blue tees, the next tee up. The first hole almost defies description. We had what I thought was the advantage of a 15 mph tailwind on the 1st all day, but now I am not so sure that was a help on this hole. There is a large bunker on the left that is instant death, but if you carry it you have the best shot into the green. There is more room to the right, but there are also large waste bunkers to gather your drive, and the angle is worse. One thing you are struck by immediately at Sweetens is that THE BALL ROLLS on the ground. This is how the game is played in Scotland and Ireland, but it’s almost a totally foreign concept in the United States. On our 3rd nine, I hit my best drive of the day, which (aided by the wind) carried the bunker on the left and ran out to 345 yards. I had 185 yards left to the green. A good drive for me these days is about 250 yards. All this to say that it is so much fun to see the ball roll again on a golf course. The drive is the easy part of the 1st. I am still not sure exactly how to play this hole. Playing downwind, there is absolutely no way to get your approach shot, whether from 185 or 90 yards, within 25 feet of the right hand hole location. If you do lay up on your second shot, there are pot bunkers to avoid on the left, but I think that is again the better angle into the green. There is more room to lay up on the right. The green is fantastic, like every green at Sweetens. I can see how different hole locations would completely change the strategy for how to play virtually every hole on the golf course. We were excited to play our 2nd nine, because we then had some concept of how to approach each green. Your first time out there is no way to know. The 1st hole is a puzzle that I can’t wait to try to solve again. The 2nd hole seems to be a short and somewhat unassuming par 4. However, it reveals it challenges quickly. It’s tempting to bomb a driver, but I think it might make more sense for better players to exercise a little more restraint off the tee. There are very high native grass areas on both sides of the fairway. The approach shot into the fantastically multi-tiered green is the key to the hole. We played the front pin position, which I believe is only accessible with a run-up shot along the ground that rolls past the hole and utilizes the slope to funnel back down to the pin. However, the approach method is somewhat dependent on the wind. Into the wind, a wedge through the air might be able to take advantage of the slope behind this front pin and roll back. If you do go long onto the upper tier of the green, you will be playing your third shot back from the fairway in front of the green. There is no way, that I am aware of, to stop a putt or a chip from the upper level to the lower level. There is a feeling of openness and sense of constant movement at Sweetens Cove that you only find at places like The Old Course, Gullane #1 or Connemara. You start to to feel that as you walk down the 1st or 2nd holes, but even more as you start on the 3rd. You are always vaguely aware of groups playing other holes, as you see them progress along in the distance. This is a pleasant aspect of golf that you do not find on the majority of American courses. You also often hear infectious laughter coming across the course from other groups. 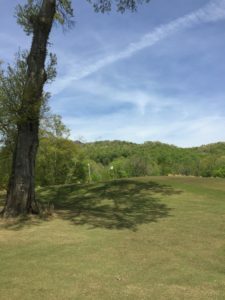 We had several occasions during our 27 holes when we all spontaneously burst out laughing, when a ball took a slope and rolled down to the hole, or even off rolled the green completely. How often do you hear that kind of laughter on most golf courses? Back to the 3rd hole, the second par 5 on the course. A drive down the left offers the best angle for the 2nd shot, but the native areas along Battle Creek come into play. There is more room to the right, but waste areas extend down the majority of the right hand side. Along the left, we were fascinated by an old picnic pavilion on Battle Creek, strung with Christmas lights. 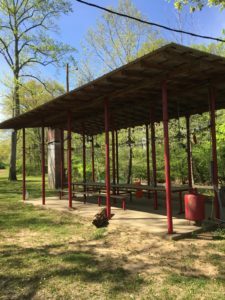 We imagined Patrick holding court here with a group of friends on a nice Spring evening with a bottle of Springbank, while somebody grilled hamburgers and hot dogs. There is a nice simplicity and character to the structure, which had to be left over from the old Sequatchie course. Hopefully having found the 3rd fairway on your drive, the layup does not appear at first glance too be overly challenging. Longer hitters may even attempt to reach the green, which is guarded ferociously by a lone tree. However, the green is other worldly. I won’t even attempt to describe it in detail. The layup is totally dependent on the hole location, which was on the extreme front level of this Sir Alister Mackenzie-esque boomerang green. The only layup which gives you any chance at this particular hole location is directly in front of the green, in line with the pin. If you go past the tree on the right, you are playing (if not praying) for bogey. As is a recurring theme at Sweetens Cove, the hole location totally changes the strategy for second shot on the 3rd. The 4th hole is a par 3 called KING. It is a mostly blind tee shot to a massive Old Course size green that has many levels. We played it to the front right hole location, so I can’t yet speak as to how it would play if the pin was all the way back. I imagine it could be as much as a 3 club difference from the tee. For the front right pin, you have to play 40 feet left of the flag and let the slope bring it down. There is no way to know that the first time you play the hole. If you go directly at this flag, it will end up off the green to the right, with a virtually impossible chip. It is a delightful hole, that is somewhat reminiscent of the 16th at Crail. Much of the talk on the drive back home was about trying to agree on our favorite hole at Sweetens Cove. 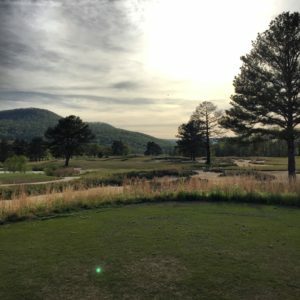 The consensus finally settled on the 5th, a drivable par 4 that embodies all the aspects that make this place so unique and enjoyable. The wind was behind us all day the 5th tee, so we all went for the green each time we came through. Just short of the green is a massive bunker which extends to infinity to the right. 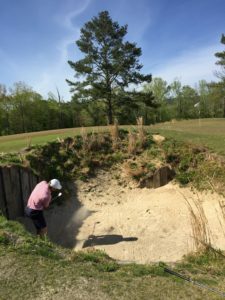 If you carry this bunker, you will likely run to the back of the green on a downwind tee shot. From the back fringe to the front pin location is a difficult proposition, at best. Just left of the green is a pot bunker that would not be out of place at Prestwick. Surely this bunker will have a name soon, if it does not already. I am hereby naming it the Strath bunker, after the 11th at The Old Course. It guards the green unmercifully and it is certain death. I love this hole. We all drove the green at least once, but never made birdie all day. However, we all parred the hole multiple times. Is this not the essence of fun on a golf course? Ironically, the best chance for a birdie may be to lay up off the tee with a 4 iron and play a wedge in. However, it’s so dependent on the wind and the hole location though, I can’t really be certain. If I do have a least favorite hole on the course, it is the 6th. It is maniacally hard hole, but my ranking is probably more owed to the fact that I have a tendency to hit a smother hook and this is hole is guarded all the way down the left by a lake. It is the only time water comes into play on the course. It is, nonetheless, a good golf hole and the green is characteristically brilliant. In fairness, even Royal County Down has a pond on the 17th. We played to the far right pin position and could not manage a single two-putt between us in 3 tries. The 7th is another brilliant short par 4. It is drivable for the very long hitters, depending on the wind. Once again, going for the green off the tee can lead to many other problems, such as long right, from which recovery is a virtual impossibility. For the middle front pin position, there is a ridge that funnels the ball back to the hole. Jake played a run-up 3 wood from 30 yards out that rolled past the hole, up the ridge, and rolled back down within an inch of an eagle. This was an occasion when I laughed out loud. What a fun hole. The 8th is yet another great par 4. The drive offers so many options. This is one of the more enjoyable tee shots on the entire course. 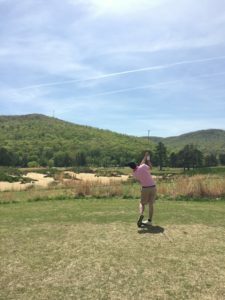 You can choose to try to bomb it left over several disastrous bunkers and have a better view of the green, or go more or less straight off the tee which leaves a more blind shot to the green. The green has a punchbowl section in the middle, where the flag location was that day. The approach will funnel down to the hole from either the right or the left, but if you are a little short it will come back down the fairway. It reminds me of the 3rd green at Machrihanish. In fact, all the green complexes at Sweetens remind me of the great course in Kintyre, Scotland. This is the highest compliment I can make. This particular hole location is so much fun, we all tried a few different shots from around the green, just to see the results. The 9th is a tremendous finishing par 3 that is semi-blind over an expansive waste area bunker. If you come up short (or go long for that matter) you will be struggling to make bogey, much less par. The green is fantastically tiered, as you might expect. Our hole location was on the lower left. The only way to get close to the pin was to play about 15 feet to the right off the tee and let it funnel down. Any tee shot right at the pin, or just left of it, fell all the way off the green. 7, 8 and 9 all work so well together. They almost seem to be a reward for surviving the 6th. 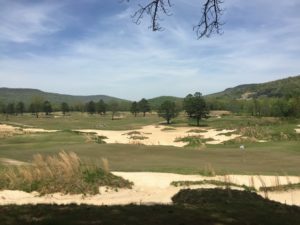 A large part of the charm of Sweetens Cove is it’s singular focus on the game of golf. There are absolutely no frills. As an Architect, I could easily envision a simple new clubhouse, featuring a bar with large bay windows looking over the 9th green. I’d probably even give King Collins a discounted architectural fee to design the building for them. But on one hand, I almost hope the “clubhouse” stays the way it is for awhile. As a one room shack for Patrick to hold forth on the joys of Sweetens Cove. There is something about it that fits perfectly with the character of this place. Patrick booking our tee time for our next visit. I was lucky enough to be an Overseas Member at the aforementioned Machrihanish Golf Club on the Kintyre Peninsula in Scotland for over 15 years. Machrihanish was designed by Old Tom Morris. It is one of the world’s greatest golf courses. When the US economy tanked in 2009, I had to give up the membership, even though it was really only a nominal yearly fee. However, I was lucky enough to make 3 extended trips over that time period as a member and play the course at least 30 times. Over the years people have often asked me to describe what Machrihanish is like. With all due respect to The Old Course, I always tell them that in my opinion, it’s The Secret Home of Golf. After spending the day at Sweetens Cove Golf Club, I believe I’ve found the Secret Home of Golf In America. I can’t wait to go back and play 36….or 54. Enjoyed the article, had a great experience when I went up to play Sweetens before playing Honours. Good luck on the posting – only question I have is if you will do an email list for new posts? My son Chester and I can not get enough of Seeetens. Had the honor of playing with Rob Collins and my dream would be to have Rob transform another forgotten tract into a future Seeetens 2.0. Thanks for your amazing article to let other avid golfers in on the greatest secret in golf. Thank you for reading. 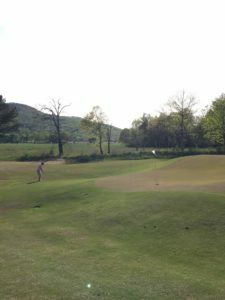 Hope to try the course at Sewanee this weekend then swing by Sweetens for 9 on the way home. Thank you. Yes there should be a link to my twitter account on the right side of the page.